Known by many for his fan-pleasing performance as the eccentric Mad-Eye Moody in the Harry Potter series, Brendan Gleeson has always been a versatile and supremely talented actor and he continues to excel here in another collaboration with director John McDonagh, with whom he previously worked on the darkly comic ‘The Guard’. Indeed, Gleeson’s collaboration with the McDonaghs doesn’t stop at John since he also worked with Martin on ‘In Bruges’, a gem of a film that succeeds on every level. 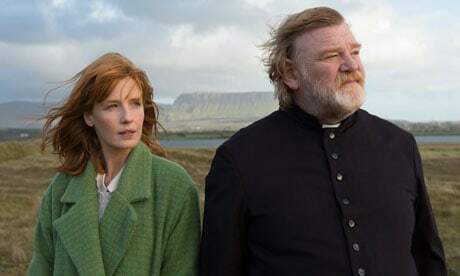 ‘Calvary’ is definitely of a similar tone to the McDonaghs’ previous works and is definitely bolstered by Gleeson, but it’s an even darker sort of comedy in many ways. Created so as to be the antithesis of his character in ‘The Guard’, Gleeson plays a priest, Father James, who tries his best to be a forgiving, amiable and comforting presence to his flock and yet is continually met with scathing and hurtful remarks about the nature of priesthood and even his own seemingly good advice is sarcastically admonished by everyone around him. McDonagh deals with the animosity surrounding the Catholic church well, as even in this Irish village where everyone still attends Mass, no one really listens to James and in one notable scene the paranoia over Catholic priesthood comes to a head when a parent refuses to allow his child to talk to him, fearing for what he might do. This sort of treatment has an effect on James who is also nursing his daughter, played by Kelly Reilly, through personal problems and trying to keep a brave face on despite his continued nagging doubts about the nature of his profession and what it even does for those around him. All this stuff is elegantly weaved around a startling beginning to the film, expertly crafted by McDonagh to be as tense as possible, and which after the opening scene almost takes a backseat amidst all the other drama. The transformation that we see in Gleeson’s character over the course of the film is the most interesting part of the whole film, and the whodunnit element definitely works as a sideplot. ‘Calvary’ may be less amusing than films like ‘The Guard’, ‘In Bruges’ and even ‘Seven Psychopaths’ but its focus is more on its more dramatic aspects, though McDonagh makes sure to remember to make you chuckle now and then. As an examination of character it’s a very well written, well acted work which does admittedly rely on a few dramatic contrivances (the sheer variation of the people in the small Irish village is quite hard to believe) but puts all that to one side. It’s nice to see Brendan’s son Domhnall in quite an interesting, small role too. Families as talented as the McDonaghs and the Gleesons are really quite annoying to be honest.